Princess Soft Synth is a set of 3 software in one, try to believe!! Now in the new release 1.3 it is even more performing and interesting. 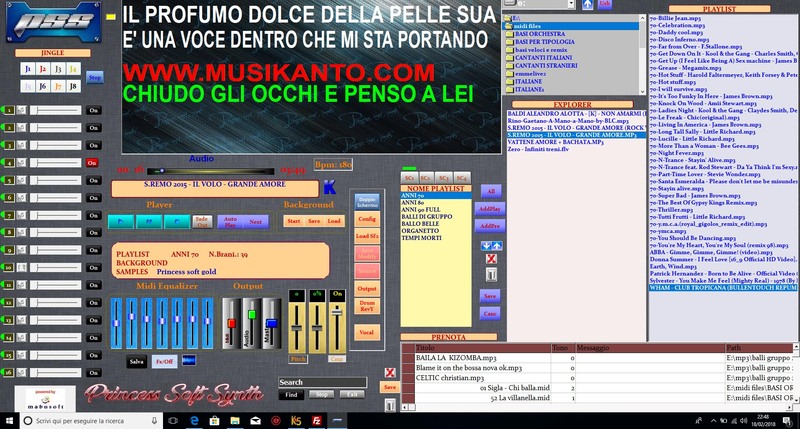 Thanks to the mabusoft partnership, the creation, reading and management of MULTITRACCIA audio files has been implemented with the possibility of exporting an infinity of mp3!! The multi-track is widely used by professionals, but also by music students and all those people who need to have separate but synchronized tracks, without renouncing flexibility of use and sound quality. - font change - midi karaoke search, search for files with vocalists, tune1000 search, etc. Princess Soft Violet is a sound bank with extension .sf2 that can be used on any synth that provides for its reading, such as Virtualmidisynth, Winlive Synth Orchestra, Karaoke5 and Hiplay. It is the result of a selection of the best presets available on the web and dozens of presets created from studio samples. The construction of this sound bank, in continuous updating, took many months of hard work. In fact, we have managed to mix all the presets in an addictive soundtrack and, listening to the midi files with this bank, you have the feeling of being live. the sound is not completely standardised as in many hardware modules, but sometimes it is dirty but always balanced. the bass is very much present as well as the drums, the strings and pads are very balanced. You will not believe in your ears! princess soft princess sf2 will allow you to play almost all gm and gs midi bases.